In a recent study conducted by financial services provider State Street and reported in the magazine, Strategic Risk (http://www.strategic-risk-global.com/story.aspx?source=NewsAnalNewsAlert&storycode=1403323), fully 93% of respondents in the Americas view improving the assessment and pricing of risk as a major challenge, while more than one-quarter of insurance companies around the world are experiencing difficulties in managing risk. The impacts of these challenges are global in scope and have profound effects on financial markets as well as the accessibility of capital. In part, these challenges arise from systems, traditionally used by insurers, markets and individual companies, that fail to develop a complete picture of possible risks. That is why the Implications Wheel® system has proven so valuable. The I-Wheel™ process enables users systematically to identify social, political, economic and other qualitative risks well in advance, providing a reliable source of data that, when coupled with more traditional quantitative data analysis, provides a complete picture for risk assessment. The obstacles to effectively assessing, pricing and managing risk can be – and, for those who have applied the I-Wheel over the past 40 years, have been – overcome successfully. 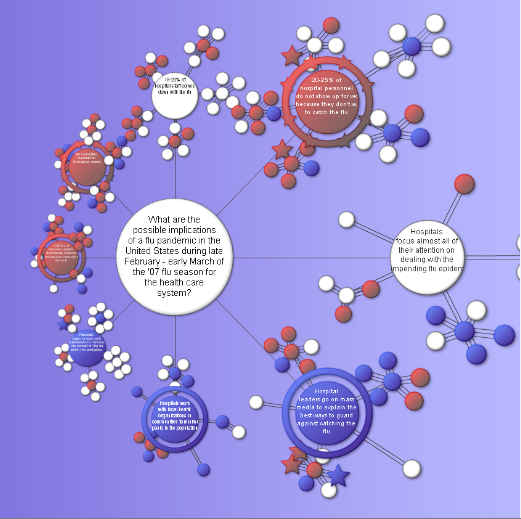 A completed Implications Wheel®, showing potential areas of risk (red), opportunities (blue) and “Black Swans” (starred).